Buy through MusicWeb for £26.00/27.50 postage paid World-wide. Peterson-Berger's orchestral music is warm and lyrical permeated with the spirit if not the letter of Swedish folksong. While others contemplate the prospect, CPO have seized the day. This German company have built a justified reputation for complete cycles produced with both dogged determination and inspiration. They do not go in for dutiful lacuna-filling. There is life in their projects - there has to be or they will pass by and wait until the right moment and the right collaboration � usually with one of the European radio stations. 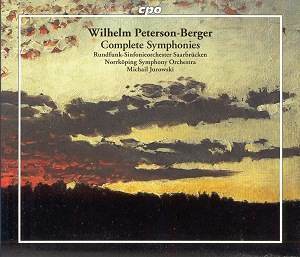 Who else than CPO would have worked with the orchestras at Norrkoping and Saarbrucken to produce the complete symphonies and orchestral music of Wilhelm PetersonBerger. For many years we had to make do with just symphonies 2 and 3 and violin concerto on Swedish EMI. Swedish company, Sterling adroitly recoded symphonies 1 and 5 in 1996 and this is still very much worth getting but no one else has shown the resolve mustered by CPO. Across five CDs and the period 1997 to 2003 we now have, at a very attractive price, the complete five symphonies plus the violin concerto and a selection of suites, genre pieces, romances and a suite of orchestrations from his famous piano cycle Frösöblomster. Reviews of the later individual discs can be found on the site and I confess that I have recycled my own review of CD 5. The discs remain available at CPO's usual low premium price. However if you fancy a systematic serious-minded exploration of the orchestral works of one of Sweden's great romantic voices this set is an easy choice. The packaging is simple. What we have is a card slip-case sleeve into which the five individual CDs have been inserted straight off the CPO warehouse shelves. Simple and inspired - it matches their Atterburg, Rangstrom, Toch and Frankel projects. The First Symphony is a charmer: sunny, pastoral, easy on the ear and not at all afflicted with tragedy at least not until we reach the third movement: At the hero�s bier which offers a grieving interlude. However we soon return to the rustic chivalry of Ludolf Nielsen, Goldmark, Raff and Bizet. Here is a composer with a light graciousness of touch. The finale ends with a briefly portentous farewell. The Suite I Somras (Last Summer) is in six movements each with a pastoral title. While CPO's notes claim the influence of Grieg I really do not hear it. However the writing does show a mastery and imagination above that of the First Symphony. This is warm writing with little or nothing of the nineteenth century about it. There is even the occasional Delian touch as in the little fanfare figures in Squirrel and Wood Pigeon. Hushed leaf-rustling magic haunts the pages of The Pine Forest - superbly done by Jurowski and his Saarbrucken orchestra. The Mountain Stream's bubbling and trickling progress is most imaginatively and quietly put across. Chanting woodwind and pizzicato here suggest a work lying in the future: de Falla's Nights in the Gardens of Spain. After a brief climax the gentle magical orchestration returns and ends the suite in what seems like a summery evening. The movement is not perhaps the most effective with which to end the suite; it is the shortest of the six. The suite would make help make up a nice themed concert with Bax's Tale the Pine Trees Knew, Respighi's Pines of Rome and Arnold's The Larches not to mention the forest tone-poems of Lilburn and Glazunov. The Second Symphony is a captivating work - impulsive and exhilarating. It conveys the sense if childhood summer mornings in the second movement. There are plenty of woodwind solos, harp idylls and murmurous reflections. Galloping delight very similar in the middle movement to Howard Hanson (child of an expatriate Swedish family) in his First Symphony The Nordic. The Romance is for violin and orchestra. It proceeds at an easy lope but warms to romantic passion rather than fireworks � in this sense it is similar to the Stenhammar romances and the Chausson Poème. Oriental Dance is an early work and this certainly does show the influence of Grieg. It predates oriental efforts by Atterburg and Nielsen. The Overture or Forspel to the ill-fated and now lost cantata Sveagaldrar is a thing of Ruritanian pomp and then of waltz-time sentimentality and luxurious dewy romance. PB loved the great outdoors and often went on walking expeditions through the Swedish mountains. The Same Atnam symphony, his third, was written in 1913-15. It is another idyllic piece but with a hard glint imparted by orchestral piano, harp and string pizzicato. Lilting melodies of heartbreaking simplicity were part of his stock-in-trade and we hear them throughout this work which rejoices in its chamber textures. The Lapp folk element is apparently to be sensed in the treatment rather than any direct quotations. The first movement has its echoes of Tchaikovsky 5 and at the beginning a striking prediction of the RVW Fifth Symphony from almost forty years later. The second movement has a unique 'hiccuping' introduction then launches into a night-ride evocation of a horse-drawn sledge. Later it almost echoes Rimsky�s Russian Easter Festival. The third movement is descriptive of a Scandinavian summer-night, warm, yearning for delight and once again the prese3nce of that tinkling solo piano. The finale, Dreams of the Future, draws music that is resolute and confident. Once again that solo piano recalls a contemporaneous work, Bax's Symphonic Variations. All ends not in symphonic clamour but in a modest falling to rest. Thank you Stig Jacobsson for telling us that Stokowski performed the symphony in Philadelphia in 1927. Like I somras, the suite Earina - concerned with spring, renewal and pagan ritual - derives from a piano suite of which PB wrote many. He wrote the piano suite of this name in 1917. That ha	d seven movements where this has five. The music is light of tread yet seriously reflective of the composer's delight in things of the summery months. The Chorale and Fugue from Domesdagprofeterna can be heard in context in the recently released Sterling CD of excerpts from the opera. Here it communicates as a grave and subdued hymn followed by the Fugue which is an intermezzo extracted by Gunnar Johannsson from the opera to create this bipartite concert item. It's a fairly sombre affair overall quite at odds with the opera itself which is a lyrical and brightly polished optimistic fantasy. There is a third suite for orchestra called Italiana but the orchestral version of that has been lost. The fourth disc has the Fourth Symphony Holmia as its centrepiece. It's the shortest of the symphonies and is in three movements. It is an emotional personal portrait of the Swedish capital. Holmia is a fanciful latin name for Stockholm. The writing is full of grace and is sometimes flighty, effervescent and often given to poetic reflection. It sometimes evokes memories of Alfvén's rhapsodies and is in the same spirit as say the symphonies of Weber and Bizet although with a modern Swedish nationalist accent. Certainly it's not a conventionally serious symphony so listeners should prepare themselves for something in the nature of a charmingly well-formed suite rather than anything more ambitious. This is its first complete recording. Lyckan or Happiness is a musical fairytale based on Sleeping Beauty. The suite has the title Törnrossagan (The Story of Sleeping Beauty). It dates from 1903, the same year as his PB�s opera Ran. It's in ten movements with music as charming as that in Holmia. Voices to be glimpsed in this high-flown, light, bombastic, dreamy and sentimental music include Tchaikovsky, Glazunov, Delibes and Massenet. Jurowski points the music very neatly. Continuing the mood we come to the composer's 1934 orchestration of five movements from his 1890s piano cycle Frösöblomster (The Flowers of Frösö). The instrumentation is as light as down - the composer knew these were fragile beauties which required careful colouring. That's exactly what they get. They are again delightful with echoes of Tchaikovsky, early Delius, Massenet and Grieg. It's no surprise that the movement markings include the words grazia, leggiero, semplice and dolce. Finally there's the second ever complete recording of the Fifth Symphony. The first was released in 1997 by Bo Hyttner's Sterling label (CDS-1006-2) where the even more generous coupling is the world premiere recording of the First Symphony. After a graciously stop-start little scherzando comes an oboe-ushered andante tranquillo reminiscent of Butterworth's Banks of Green Willow but soon developing an almost Graingerian harmonium tone. The finale is sparklingly rumbustious with folk-dance excitingly woven around alternating jollity and heroism. All ends in a series of silver-dripping bardic harp arpeggios. On balance I prefer Jurowski for his greater vitality. His first movement is five minutes shorter than Jurowski's 14:39; mind you the tempo indication is con moto tranquillo. The CPO recording is also a shade less transparent. The Violin Concerto was completed five years earlier, having been started in 1912. Nilla Pierrou recorded it in October 1967. The Pierrou recording is still the only alternative to this Wallin version. The Pierrou is on Phono-Suecia ECHO PSCD 95 (previously released on Swedish HMV LP CSDS 1083) and it is coupled with the best of the Peterson-Berger symphonies No. 2 Sunnanfärd (Journey to the South). The concerto has that searching and singing soul associated with the Delius Violin Concerto but is touched also with the Glazunov, the Dvoř�k, sometimes the Elgar .... and, surprisingly often, the Bax. A stamping thudding gusto (Des Irae from Verdi's Requiem) forms the backdrop to the opening pages of the finale over which the violin sings at first peacefully then develops a more animated chattering and darting spirit which often sounds slightly Chinese (probably influenced by Turandot). In the Pierrou version the soloist is recorded very closely - you won�t miss a detail but dynamic contrast is ironed out. It has no shortage of impact and a real grip on your lapels but the orchestra on occasion slips backwards into a generalised focus. Top marks for virile immediacy but less so for poetic distance. So ends CPO's admirable project to build a complete Peterson-Berger orchestral series. A resoundingly successful outcome.